Nothing says summer like ears of fresh corn piled up in your grocery or farmer's market. Cooking methods for corn on the cob vary from less than 5 minutes to about 20 minutes. With any method, you'll have a fresh vegetable with good amounts of carbs, fiber, B vitamins, minerals and beneficial chemicals like beta carotene and lutein. The downside of corn is that it's high on the glycemic index. Like other starchy vegetables, such as white potatoes and peas, corn may not be a good choice if you have diabetes or need to lose weight. 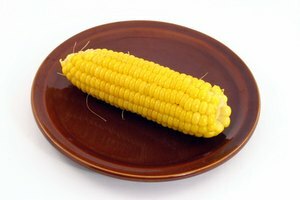 That said, eating fresh corn along with the rest of summer's bounty of fruits and vegetables can definitely be part of a healthy diet. Fresh corn with the outer green husks removed takes only 3 to 5 minutes once you pop it into a pot of boiling water. If you don't need to watch your salt intake, salt the water before adding the corn. Use enough water to completely cover the corn, or reshuffle the corn in the pot two or three times during cooking to make sure that every ear has a chance to be completely submerged. Older corn will take a few minutes longer to cook – pull off a kernel or two to taste for doneness. Corn cooked in the microwave has the advantage of cooking without using any boiling water and without using any pot at all. This ultra-simple method works only if you have just two or three ears to cook. Leave the ears in their husks, cutting off any long stalks or strings of corn silk hanging out beyond the husk. Then, microwave two ears at a time on high power for 4 to 6 minutes. Let the corn cool for a minute or two before shucking the husks and pulling all the silk off. If you have a large crowd to cook for and plenty of time, cooking corn in the oven makes sense. Prepare the corn by removing the husks and silk. Then, spray the ears all over with heart-healthy olive oil cooking spray. If you want to boost the flavor of the corn, add salt, pepper and herbs such as fresh or dried basil, crushed rosemary or chopped, fresh dill. Wrap each ear separately in foil and bake for about 20 minutes in a 400-degree Fahrenheit oven. 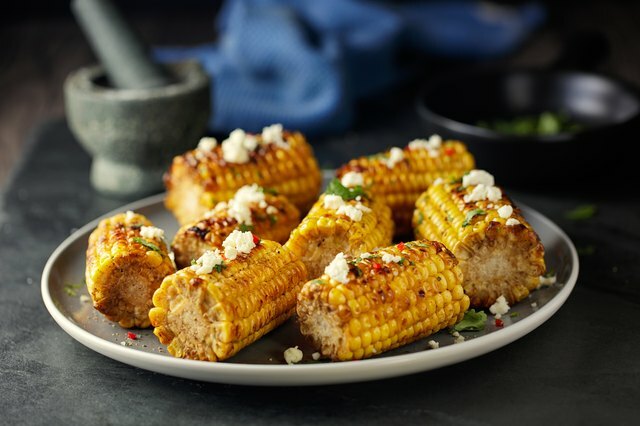 Cooking corn on the grill keeps heat out of the kitchen and, as with all grilling, is just plain fun to do. Prepare the ears by cutting off long stems and peeling the husks back halfway. Remove the silk, brush the corn with heart-healthy olive oil and add any herbs or spices. Then, pull the husks back up, and wrap a little foil around the top of the husk so it doesn't fall open. Place the ears on a grill heated to medium-hot, and let them cook for about 15 minutes, turning them occasionally. The outer husks will become charred, but the kernels will come out smoky and delicious. Remove the husks before serving to make the corn easier to eat. The idea of cooking shucked ears of corn for 30 minutes in a cooler filled with boiling water may sound like a good idea, until you take a look at safety concerns. Older coolers may contain bisphenol A, or BPA, a chemical in plastics found to cause cancer in rats. But even with newer coolers, chemicals from plastic can leech into the water and the corn once you pour in boiling water. Instead of using a plastic cooler, use a metal stock pot or save corn on the cob for picnic spots with a grill or for backyard picnics where you can cook the corn in your own kitchen.